With the launch of Google+ a couple of weeks ago, everyone has had fun learning the ins and outs of how they can best utilize it for not only themselves (circle me), but for their brands. Many brands even went ahead and created accounts as a brand despite being against Google's wishes. It did not take long for those accounts to be removed or converted to an actual name of a person, hence +Mashable converting to +Pete Cashmore. 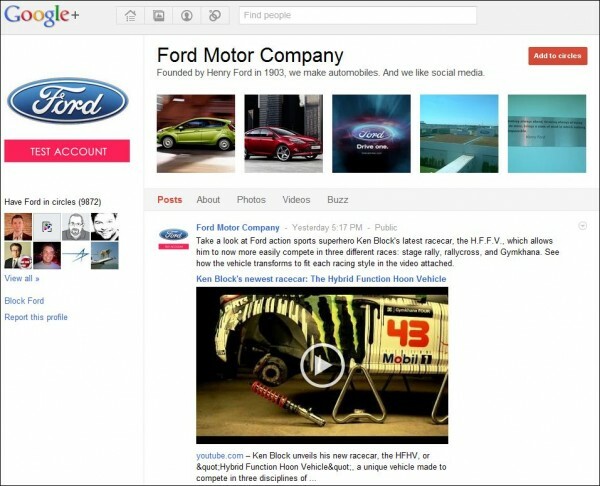 Google is currently testing accounts for brands (see Ford example below), but what is next for them? ...I have my opinions on what I'd like to see. 1. I would like to see the brands be limited to actual brands. I don't care whether a pickle can get more people to add it to a circle than Nickelback. I am sick of seeing worthless pages for people to "like" on Facebook and hope that does not carry over to Google+. 2. It would be ideal to integrate Google Places listings with Google+ brands. If the Places listing has been claimed, mostly everything in there should be relevant. 3. Integration with HotPot when applicable. It hasn't fully taken off yet, but reviews and location based social media are not going anywhere anytime soon. 4. Better analytics that are more in line with Google Analytics. It would be nice to access it easily through the same Google Analytics dashboard as well. 5. Ability to add deals/coupons right through the interface without a 3rd party application. I would like to see this from both a marketer and consumer standpoint. I would envision it would be similar to Foursquare. This is probably not likely, but who knows. What would you like to see for the brand pages? Leave your suggestions in the comments.